Maharashtra Rail Infrastructure Development Corporation Limited is a Joint venture of Govt. of Maharashtra and Ministry of Railways incorporated on 8th August 2017. The aim of MRIDC is also to identify the traffic potential of different regions of the state including rail connectivity to the neighbouring states and find out economically viable projects and implement them with fast track construction and commissioning. The company is having wide ranging jurisdiction as mentioned in the Memorandum of Association and has immense potential to perform and grow. However, the company will carry on the business ordinarily in the territory of Maharashtra. In Maharashtra state, only a total of 180 Kms. New line and 456 Kms. doubling has been commissioned during last seven years from 2011-12 to 2017-18. As against this performance, there are large number of projects sanctioned and are yet to be commissioned. As on 01-04-2018, there are 688 Kms. of new lines and 2449 Kms. of doubling is clearly sanctioned. Besides there are 1149 Kms. of new line, 106 Kms of gauge conversion and 124 Kms. of doubling are sanctioned with partial project funding from outside. Future 380 Kms. of new line is included in capital investment program 2016-17. In addition to these sanctioned projects, there are 54 surveys sanctioned, covering length of 6544 Kms. Even if 20 % of these surveys get converted into sanction of the projects, it will increase the arrears of incomplete projects considerably. MRIDC will be committed to wipe out these arrears and also will be maintaining these new assets. To carry on the business of acting as a nodal agency for development, establishment, operation and maintenance of all type of railway infrastructure and other infrastructure projects and facilities. To promote, assist, advise, render and provide, participative and management services. To mobilise capital from financial investors and to manage the investment of such funds in infrastructure projects. To make studies, surveys, detailed project reports and tests to determine the desirability, viability and feasibility of establishing railway projects in the territory of India and to process for sanctioning viable Railway Projects. To carry on all business relating to railways and related business activities and to enter into contracts in India or abroad on a turnkey basis or otherwise either individually or jointly with other undertakings, companies, firms, private or public agencies. Erecting, operating and maintaining or repairing the telephone lines, signal system, electric traction equipment, power supply and distribution installation in connection with the working of the Railways. Making and maintaining works for the accommodation of the owners and occupiers of lands adjoining the Railways. Establishment of mass transit and other people mover systems of all types. Doing all other acts necessary for making, operating maintaining, altering or repairing and using the railway. To construct operate and maintain railway infrastructure, accommodation and conveyance along with other related facilities connected with the opening, operation and closing of railway and providing traffic facilities there to. To build, construct, operate, develop, finance and maintain viable railway projects and / or projects with viability gap funding in the territory of India, which will be used for both freight and passenger services and to develop required rail infrastructure including construction of railway lines together with all related rail facilities. To carry on the business of construction work comprising of civil and all infrastructure works, on turnkey basis or on labour contracts or otherwise. To buy lease or otherwise acquire lands including forest land, buildings, works, mines, mineral deposits, mining rights, plantation, forest and any other movable or immovable properties. To acquire from any person, firm or body corporate whether in India and / or outside India in the public or private sector, technical information, know how, process engineering manufacturing and operating data etc. The following activities are included in the scope of the company. Development, financing and implementation of viable railway projects and / or projects which may require viability gap funding that are important for critical connectivity / capacity enhancement. Undertaking surveys, preparation of Detailed Project Report (DPR) to examine the viability of the railway projects. Processing for sanctioning of the railway projects (identified by the Board of Director of the Company, Ministry of Railways or by Govt. of Maharashtra). Incorporation and funding of subsidiaries / special purpose vehicles for undertaking railway projects. Undertaking all such actions not specifically mentioned above, that may be required to give effect to the intent of the Ministry of Railway and Govt. of Maharashtra, as set out in Joint Venture Agreement. The Board of directors (BOD) of MRIDC consists of Non-Executive Chairman (Chief Secretary of Govt. of Maharashtra), Managing Director, two functional Directors Director (PP) appointed by Ministry of Railway and Director (BD&F) appointed by Govt. of Maharashtra. 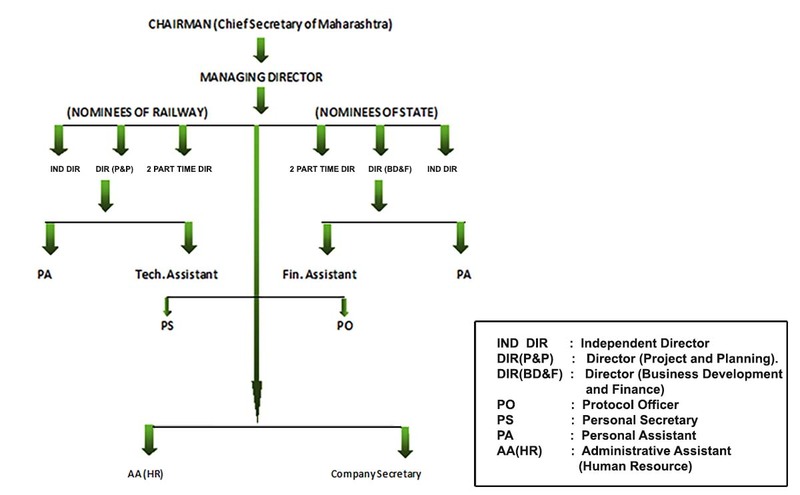 Four nominated part time directors (two each by Ministry of Railway & Govt. of Maharashtra) and two Independent directors (one each by Ministry of Railway & Govt. of Maharashtra).